Do Seat Belt Laws Legislate Personal Behavior and Do They Save Lives? When New York enacted the country’s first seat belt law in 1984, it sparked a national debate about the government’s role in personal safety. Personal freedom advocates saw seat belt laws as an encroachment on their ability to make choices. Such laws used the coercive power of law enforcement and the judiciary to make people choose between wearing a seat belt or paying the penalty. While statistics appear to support the argument that wearing seat belts saves lives in most cases, many believe that legislators should not to have the Constitutional right to dictate personal behavior. Choosing to not wear a seat belt does not create direct and discernable harm to others. That means, in essence, the government successfully crossed a threshold in 1984 that it can legislate personal behavior. Today, all 50 states have some form of seat belt law, although New Hampshire’s policy is debatable. Many states plaster highway billboards with “click it or ticket” campaigns which let drivers and passengers know that law enforcement will use its coercive powers to prompt people to comply. The argument that seat belts do enough good to be worth the infringement on personal choice has won the day. Seat belts laws are apparently here to stay, and these are statistical reasons why. Upwards of 2.6 million drivers and passengers received emergency medical treatment due to a motor vehicle accident in 2016, according to the Centers for Disease Control and Prevention (CDC). More than 23,000 people lost their lives in motor vehicle accidents in 2016. As many as 62-percent of teens 13-19 and adults 20-44 who died in car wrecks were not wearing seatbelts at the moment of impact. The CDC ranks car crashes among the leading causes of death in the United States among people 1-54 years old. Young adults between 18-24 suffer the highest rate of non-fatal automobile crashes. Non-fatal accidents reportedly accounted for upwards of $48 billion in medical and employment losses in 2010. The National Highway Traffic Safety Administration (NHTSA) reports that 14,668 lives were saved in 2016 due to seat belt use and that national usage stands at 90.1 percent. The NHTSA reports that an additional 2,456 lives could have been saved if drivers or passengers had worn seat belts. Seat Belt Laws in the U.S. The federal government has been a driving force behind automobile safety. Under federal law, all motor vehicles must come equipped with a three-point seat belt restraint system. This mandate requires car manufacturers to include a harness that runs across the lap and shoulder for all front-seat occupants. State laws, however, vary significantly but generally break down into primary or secondary enforcement of existing laws. Failure to wear a seat belt for either drivers or passengers is considered a misdemeanor in 49 of the 50 states. Only in New Hampshire can adults opt out of buckling up without penalty. In 34 states, including Washington, D.C., police can implement a traffic stop if they observe non-compliance with seat belt laws. Allowing law enforcement to proactively pull motorists over and cite them is considered primary enforcement. The other 15 states use secondary enforcement, meaning citations or charges are leveled only if a driver has been stopped for another violation. Alabama: A primary enforcement seat belt law that applies to passengers 15 years and older traveling in the front. Alabama reportedly has a compliance rate of 91.4 percent. Alaska: A primary enforcement seat belt law applies to passengers 16 years and older traveling in all seats. Alaska reportedly has a compliance rate of 86.8 percent. Arizona: A secondary enforcement seat belt law that applies to passengers 8 years and older traveling in front seats and 8-15 in all seats. Arizona reportedly has a compliance rate of 81.8 percent. Arkansas: A primary enforcement seat belt law that applies to passengers 15 years and older traveling in front seats. Arkansas reportedly has a compliance rate of 78.3 percent. California: A primary enforcement seat belt law applies to passengers 16 years and older traveling in all seats. California reportedly has a compliance rate of 96.2 percent. Colorado: A secondary enforcement seat belt law applies to passengers 16 years and older traveling in front seats. Colorado reportedly has a compliance rate of 82.9 percent. 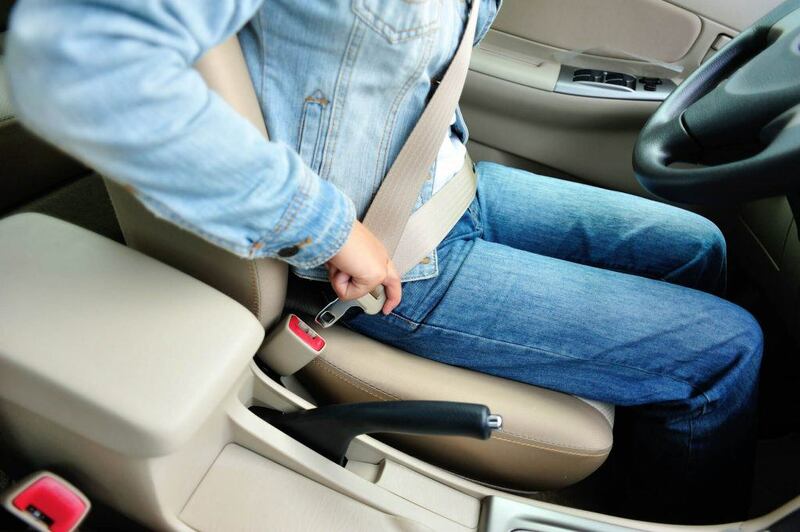 Connecticut: A primary enforcement seat belt law applies to passengers 7 years and older traveling in front seats. Connecticut reportedly has a compliance rate of 88.2 percent. Delaware: A primary enforcement seat belt law applies to passengers 16 years and older traveling in all seats. Delaware reportedly has a compliance rate of 90.7 percent. District of Columbia: A primary enforcement seat belt law applies to passengers 16 years and older traveling in all seats. D.C. reportedly has a compliance rate of 92.3 percent. Florida: A primary enforcement seat belt law applies to passengers 6 years and older traveling in front seats and 6-17 in all seats. Florida reportedly has a compliance rate of 87.4 percent. Georgia: A primary enforcement seat belt law applies to passengers 8-17 in all seats and 18 and older in front seats. Georgia reportedly has a compliance rate of 89.6 percent. Hawaii: A primary enforcement seat belt law applies to passengers 8 years and older in all seats. Hawaii reportedly has a compliance rate of 97.6 percent. Idaho: A secondary enforcement seat belt law applies to passengers 7 years and older in all seats. Idaho reportedly has a compliance rate of 77.9 percent. Illinois: A primary enforcement seat belt law applies to passengers 16 years and older in all seats. Illinois reportedly has a compliance rate of 92.6 percent. Indiana: A primary enforcement seat belt law applies to passengers 16 years and older in all seats. Indiana reportedly has a compliance rate of 92.4 percent. Iowa: A primary enforcement seat belt law applies to passengers all ages in front seats and those under 18 in rear seats. Iowa reportedly has a compliance rate of 93.1 percent. Kansas: A primary enforcement seat belt law applies to passengers 14 years and older in all seats. Kansas reportedly has a compliance rate of 81.8 percent. Kentucky: A primary enforcement seat belt law applies to passengers in all seats. Kentucky reportedly has a compliance rate of 80.3 percent. Louisiana: A primary enforcement seat belt law applies to passengers 13 years and older in front seats. Louisiana reportedly has a compliance rate of 75.9 percent. Maine A primary enforcement seat belt law applies to passengers 18 years and older in all seats. Maine reportedly has a compliance rate of 82 percent. Maryland: A primary enforcement seat belt law was to passengers 16 years and older in all seats. Maryland reportedly has a compliance rate of 94.7 percent. Massachusetts: A secondary enforcement seat belt law applies to passengers 13 years and older in all seats. Massachusetts reportedly has a compliance rate of 73.7 percent. Michigan: A primary enforcement seat belt law applies to passengers 16 years and older in front seats. Michigan reportedly has a compliance rate of 95.2 percent. Minnesota: A primary enforcement seat belt law applies to passengers in all seats. Minnesota reportedly has a compliance rate of 92.3 percent. Mississippi: A primary enforcement seat belt law applies to passengers 7 years and older in all seats. Mississippi reportedly has a compliance rate of 81 percent. Missouri: A secondary enforcement seat belt law applies to passengers 16 years and older in front seats and 8-15 in all seats. Missouri reportedly has a compliance rate of 76 percent. Montana: A secondary enforcement seat belt law applies to passengers 6 years and older in all seats. Montana reportedly has a compliance rate of 78.9 percent. Nebraska: A secondary enforcement seat belt law applies to passengers 18 years and older in front seats. Nebraska reportedly has a compliance rate of 84.1 percent. Nevada: A secondary enforcement seat belt law applies to passengers 6 years and older in all seats. Nevada reportedly has a compliance rate of 93.2 percent. New Hampshire: A primary enforcement seat belt regulation in place that only applies to minors in all seats. New Hampshire reportedly has a compliance rate of 72.2 percent. New Jersey: A primary enforcement seat belt law applies to passengers 8 years and older in all seats. New Jersey reportedly has a compliance rate of 93.7 percent. New Mexico: A primary enforcement seat belt law applies to passengers 18 years and older in all seats. New Mexico reportedly has a compliance rate of 89.8 percent. New York: A primary enforcement seat belt law applies to passengers in all seats. New York reportedly has a compliance rate of 89.8 percent. North Carolina: A primary enforcement seat belt law for front seat and secondary for backseat applies to passengers of all ages. North Carolina reportedly has a compliance rate of 89.7 percent. North Dakota: A secondary enforcement seat belt law applies to passengers 18 years and older in front seats and minors in all seats. North Dakota reportedly has a compliance rate of 74.8 percent. Ohio: A secondary enforcement seat belt law applies to passengers 15 years and older in front seats and 8-14 in all seats. Ohio reportedly has a compliance rate of 83.8 percent. Oklahoma: A primary enforcement seat belt law applies to passengers 13 years and older in front seats. Oklahoma reportedly has a compliance rate of 85.9 percent. Oregon: A primary enforcement seat belt law that applies to passengers of all ages in all seats. Oregon reportedly has a compliance rate of 97 percent. Pennsylvania: A secondary enforcement seat belt law applies to passengers 18 years and older in front seats and 8-17 in all seats. Pennsylvania reportedly has a compliance rate of 86 percent. Rhode Island: A primary enforcement seat belt law applies to passengers 8 years and older in front seats. Rhode Island reportedly has a compliance rate of 78 percent. South Carolina: A primary enforcement seat belt law applies to passengers 6 years and older in all seats. South Carolina reportedly has a compliance rate of 85.4 percent. South Dakota: A secondary enforcement seat belt law applies to passengers 18 years and older in front seats. South Dakota reportedly has a compliance rate of 74.5 percent. Tennessee: A primary enforcement seat belt law applies to passengers 16 years and older in front seats. Tennessee reportedly has a compliance rate of 87.1 percent. Texas: A primary enforcement seat belt law applies to all passengers. Texas reportedly has a compliance rate of 93.8 percent. Utah: A primary enforcement seat belt law applies to all passengers. Utah reportedly has a compliance rate of 89 percent. Vermont: A secondary enforcement seat belt law applies to all passengers. Vermont reportedly has a compliance rate of 85.2 percent. Virginia: A secondary enforcement seat belt law applies to passengers 18 years and older in front seats and minors in all seats. Virginia reportedly has a compliance rate of 80 percent. Washington: A primary enforcement seat belt law applies to passengers 8 years and older in all seats. Washington reportedly has a compliance rate of 97.6 percent. West Virginia: A primary enforcement seat belt law applies to passengers of all ages in front seats and 8-17 in all seats. West Virginia reportedly has a compliance rate of 82.1 percent. Wisconsin: A primary enforcement seat belt law applies to passengers 8 years and older in all seats. Wisconsin reportedly has a compliance rate of 79.2 percent. Wyoming: A secondary enforcement seat belt law applies to passengers 9 years and older in all seats. Wyoming reportedly has a compliance rate of 78.9 percent. Note: Minors in each state may be subject to seat belt or child carrier restraints based on age, height, and weight. According to the CDC, seat belt use is approximately 5 percent lower in states with secondary enforcement regulations than those with primary in 2017. Passengers in rear seats are reportedly 10 percent less likely to use seat belts in both primary and secondary enforcement states, putting them at increased risk. Other statistics indicate that men are less likely to use seat belts than women and those living in metro areas use them at a lower rate than suburban and rural regions. Young adults in the 18-24 demographic are less likely than older drivers despite being at enhanced statistical risk of an accident. Although non-seat belt users may argue that such laws are an infringement on personal freedom, statistics point to improved safety when seat belt laws are vigorously enforced. Ed Smith is a Sacramento Car Accident Lawyer who has helped clients all over Northern California with personal injury and wrongful death cases since 1982. In addition to representing those who have been injured in accidents, Ed also assists those who have lost a loved one in an accident. Ed is a California member of the Million Dollar Forum, a group of elite injury lawyers who have won multiple million dollar verdicts and settlements.